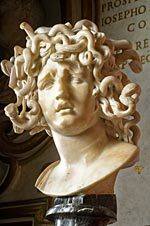 Bernini’s Medusa is in San Francisco. Go and behold her. Musei Capitolini in Rome has lent San Francisco one of their greatest treasures, the remarkable Baroque masterpiece “The Medusa” by Gian Lorenzo Bernini (1598–1680), one of art history’s finest and most productive sculptors and a virtuoso in Italian Baroque art and architecture. She was bestowed by a Cardinal to Rome in 1734 somewhat worn for wear. Bernini chose a large morsel of warm Carrara marble for its flesh like hues to carve Medusa. Recent conservation efforts have restored this sculptural triumph to its full glory and revealed previously hidden artistic techniques such as wax bits. Only the third time she has left Rome – previously in Moscow and Venice – The Medusa is displayed exclusively in San Francisco at the Legion of Honor in the museum’s Baroque gallery 6, where it can be seen in context with the Museums’ great collections of paintings and sculpture from the era of Bernini. Medusa, with a classically beautiful face and delicate features, but a venomous tongue sees herself in an imaginary mirror and is caught in the moment when she realizes the atrocious trick of fate, and before our very eyes, her soft flesh changes color, her blonde locks turn into writhing serpents and her expression of pain and anguish are forever captured in marble. Perseus rendered his name immortal by his conquest of half immortal Medusa. He cut off her head, and the blood that dropped from the wound produced the innumerable serpents that infest Africa. The conqueror placed Medusa’s head on the shield of Minerva, which he had used in his expedition. The head still retained the same petrifying power as before, as it was fatally known in the court of Cepheus. Believed to date from around 1638 to 1648, this extraordinary work takes its subject from classical mythology, as cited in Ovid’s Metamorphoses. Much of Bernini’s works was well documented so it is curious that this personal piece has no known history. It’s possible the documentation will surface in the future. It is possible the model for Medusa was his mistress – there is another signed statue that bears a resemblance. The story goes he found his mistress making love with his brother and ordered she be slashed in the face for her betrayal. He may have caught her real horror as she learned of her fate. In any case Bernini and the mystery model are forever intertwined. George and Judy Marcus are the exclusive sponsors and Mark Chapman organized the exhibit. Closes February 19, 2012. Do not miss this moment in history.